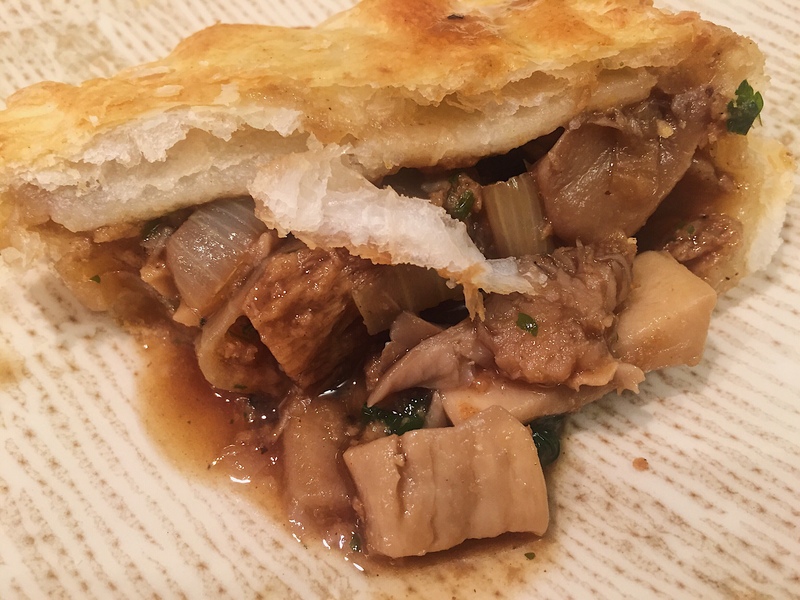 Flakey puff pastry pie packed with steak-style pieces and mushrooms, in a parsley flavoured gravy. A warm and hearty meal – perfect for a cold winters day! Pie actually isn’t really as difficult as everyone would imagine it to be! It’s probably not a meal you would make after work on a week day when you have little time on your hands, as it can be a bit fiddly with the pastry, but it’s definitely worth the challenge when you have the time on your hands. Freshly baked pastry is so much better than the frozen pies that you can buy from the supermarket. And you can adapt the filling to taste exactly how you like it! 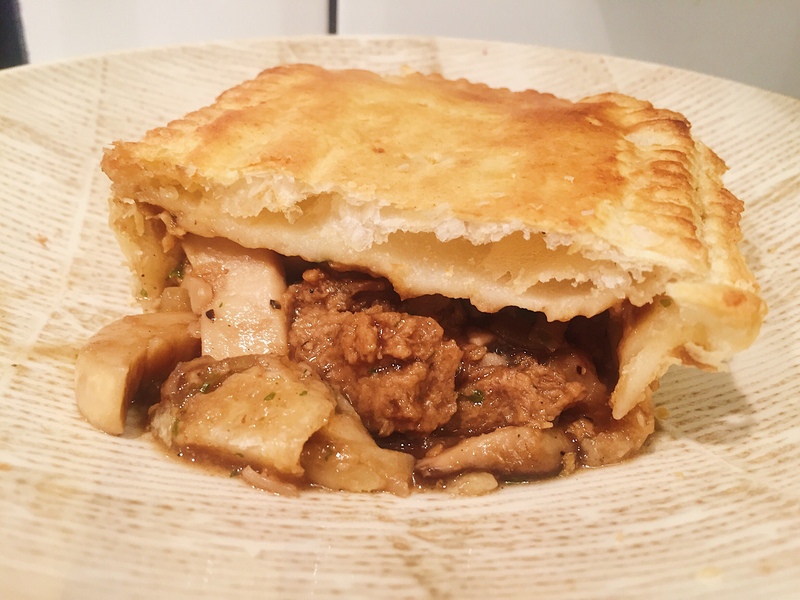 I used a selection of mushrooms in my pie to give the flavour more depth and add different textures. 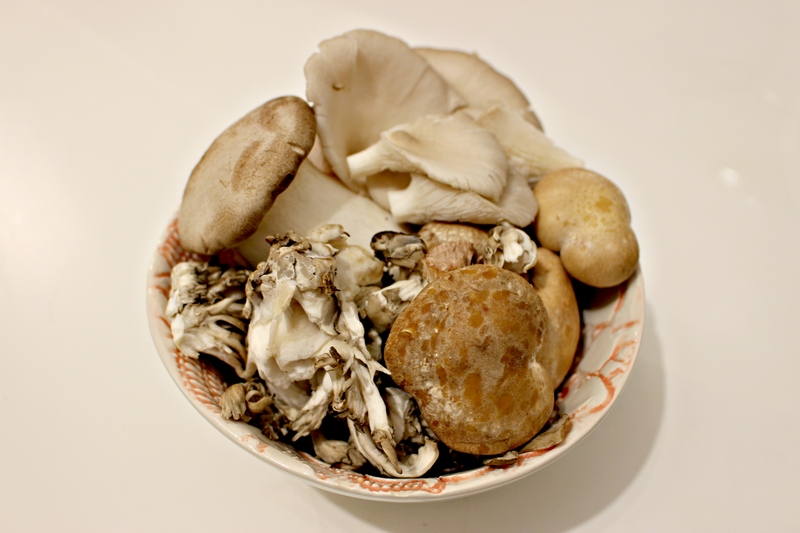 I bought a selection box from Sainsburys which included Shiitake, Eryngii, Oyster and Maitake mushrooms (I actually hadn’t heard of most of these mushrooms, but they’re delicious!). Serve your pies with creamy mash potato, chips, or even enjoy it on its own! Fry your onion and garlic in vegetable oil over a medium heat. Add the beef style pieces, and chopped mushrooms. Crumble the stock cube into the pan and fry together until the mushrooms have softened. Add the gravy granules, water, sugar and parsley and simmer until the gravy thickens. Add more gravy granules to make thicker if necessary. Dust your work surface with flour and roll your pastry out to about 0.5cm thickness. Grease your pie dishes and place the pastry inside, cutting the excess pastry off. Fill the pastry with your filling until it is about level with the top of the dish. Brush a little plant milk along the top edges of the pastry, to seal the lid. Place more rolled pastry on top and again cut off the excess. Use a fork to seal the lid to the base, and brush the top with a little more plant milk. Pierce some holes in the top of the pie to let steam out. Pop them in the oven for 20 minutes, until the top is golden brown. Looks like a piece of comfort – Yum! Thanks Cathryn!! 🙂 hope you enjoy the rest of your day! Cool blog! would you mind checking out my blog too?